"Red Barber was perhaps the most factual reporter I've ever known." 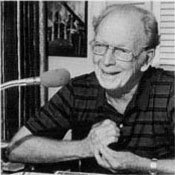 Known best as the "Voice of the Brooklyn Dodgers", the late Red Barber has several times been voted the top baseball announcer in the country. As the consummate play-by-play announcer of this nation's pastime, the "ol' Redhead's" career included 15 years with the Dodgers, five with the Cincinnati Reds, and thirteen with the New York Yankees. On August 26, 1939 Red Barber broadcast the first professional baseball games ever televised, a doubleheader between the Dodgers and the Reds at Ebbets Field in New York City. The telecast was carried over W2XBS from the top of the Empire State Building. Barber's broadcasts were noted for their fairness, accuracy and great respect for the game's traditions. His journalistic approach to sports reporting, combined with a lively and informative style, made him truly a "people's broadcaster". In his years as a sportscaster, Red compiled an impressive record, covering 13 World Series, four All-Star baseball games, five Army-Navy games and four NFL championship games. Until his death in 1992, Barber was active behind the microphone. Every Friday from his home in Tallahassee, Fla., he was a guest on National Public Radio's "Morning Edition" hosted by Bob Edwards. The two entertained and delighted millions of listeners for 12 years.